﻿ Hotel Continental Tangier. JIMAT di Agoda.com! 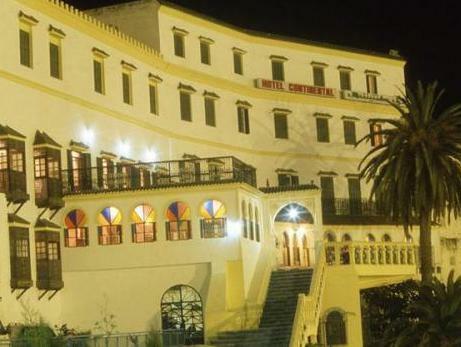 Hotel Continental ini terletak di pusat Medina di Tanger, 5-minit dari pelabuhan, menawarkan pemandangan panorama teluk Mediterranean. Continental menawarkan bilik-bilik yang selesa dengan akses internet Wi-Fi percuma. Bilik-bilik menghadap ke laut atau Medina. Hotel ini mempunyai hammam, bilik TV, restoran, dan teres yang menghadap ke laut. Tempat letak kenderaan percuma di lokasi disediakan. This quirky piece of Tangier history has lots to recommend it. While rooms are rather faded, the location, the views of the harbour, the spectacular tiling of some of the public areas, the historical bric a brac and the room prices make this hotel exceptional value for money, especially for those with a sense of nostalgia. We chose this hotel as it is walking distance from the Tangier ferry terminal. From the main street there are a number of stairs to the hotel. I also don't remember seeing a lift within the hotel. Standard clean room. Heater is available. Hot water. Breakfast sufficient. Nice terrace. I booked this hotel having already read a review describing it as faded glory. That's true and that's what I was looking for. The place may need a full going-over but it has a charm, good views, a great kitchen and is close to the busy part of Tangier as well as the port area. Ensure you get a lower-storey balcony room that match the ones in the hotel's advertising, the upper floor rooms do not have the lustre or charm. 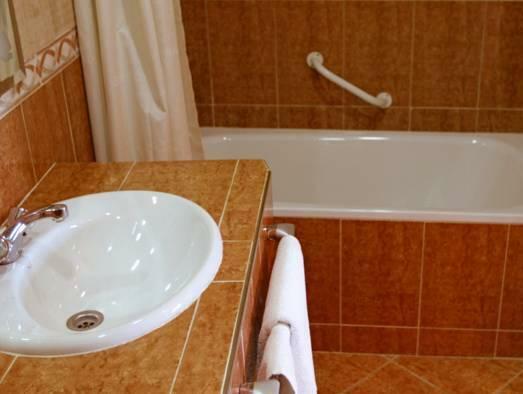 Still, the rooms and the bathroom are large. If you have a problem with stairs, steer away, this place has plenty and no elevator. Very friendly and helpful staff. Close to the harbour is the reason why i choose this hotel, BUT when you actually get there, you'll find the hotel is on the small hill, you need to carry your luggage to climb up the stairs to check-in , it's hard for an old man. No Hair-dryer in every room, you need to ask for it at the reception desk. Hot Water is only available at 18:00 - 24:00 and 6:00 - 12:00 and the hot water pressure and amount is LITTLE. THE ONLY GOOD THING is the decoration of this hotel is very BEAUTIFUL. Just five minutes by taxi from the ferry terminal we valued this proximity for a one night stay. Five minute walk int the heart of the medina and all services that might be needed e.g. banking, telecomms, shopping etc. The Hotel has some on-site parking but it is a little difficult to navigate the narrow alleys and tight corners to get there so a small car is necessary. Its an older establishment so a little dated and tired but enjoys a fabulous view over the strait, port and waterfront area. Staff are helpful, breakfast is adequate although staff seem to be a bit run off their feet having to take several flights of stairs from the kitchen to the terrace at all times so service can be slow. Prices are very reasonable, the room we had had a sea view which was great. A functional property as a 'leaping off' point into morocco. The room was good. It's centrally located. Breakfast was sinfully over-priced for the fare. Nice, cosy & continental hotel with great views. A very old hotel with very ancient furnishings. While it is conveniently located within the medina and next to the port, there isn't a main entrance for vehicles to pull up. Many steps to climb especially if your taxi drops you off at the big car park near the sea front. More steps to climb as the hotel does not have elevators. The plus point for us is the close proximity to the port where we took the ferry into Tarifa. I wish some private company or the Moroccan government would take up the restoration of this heritage building that has faded over time, If properly restore, it can very well compete with the best in the world with its location, architecture, history and elegance. Location from ferry & train station & old quarter. Comfortable for the 3night stay. The cafe area for breakfast was beautiful & had a great view. This hotel should be deleted from Agoda...too old, too terrible...and the hotel staff ate more of the breakfast buffet than the guests...buffet was hopeless anyway...and no alcohol allowed. Many better hotels in Tangir with good price and good locations. Best thing was checking out. Close to the port, borders on the medina, great view towards the ocean, fast internet, friendly staff and is gated with an employee at the front too. Only negative is that since it is a tourist hotel, the touts hang around outside the gates waiting for tourists and they are quiet persistent. Nice furniture, good staff, a secure refuge from the hassle of the city. This hotel is beautiful and interesting, it has helpful staff, and it provides a great refuge from the surrounding city (which is something you will need). The dinner restaurant is quite good, the on-site bizarre has higher quality antique oddities than the usual tourist fare, and the furniture in our room was very nice indeed. As with any hotel in Tangier, I suspect, the local youth will meet you out the front and follow you through the streets harassing you to go to some restaurant or somesuch. We adopted the practise of telling them that we were from a similar but slightly less wealthy country than we are actually from, as they know what tourists from each country are likely worth. The hotel is easy to find, walking distance from the ferry pier and right on the edge of the Medina. It is in a walled courtyard, so feels very secure. Staff are unobtrusive but helpful. Rooms are basic, but clean and spacious. We had a view over the port and coastline. The location can’t be faulted and the price was excellent. + location for old town (medina) activities such as shopping and sightseeing (if you want a beach holiday then go for a place in new town) but also good as it is close to the entrance of old town it is a short walk down the boulevard and to cafe de paris area, the hotel is very pretty in parts and really has charm, free wifi throughout the hotel, friendly staff at the front desk, beds were ok, clean - changed rooms as in the first room we had the toilet door was broken, also the decor of the ac rooms is too boring and feels cheap when you have seen the interior of the old part of the hotel, there should honestly be air con in all the rooms in my opinion, breakfast was poor and not offering much choice, the restaurant was a major disappointment as it was coming close to closing time (maybe 30min before kitchen closed according to their opening hours) they refused to take any order if it was not a main. This was a one night stay en route to elsewhere and as such worked out well although first appearances were off putting as the outside needs renovation. The location is opposite to the old port so sea views from the terraces are lovely. The cleanliness left a little to be desired but the decor was so quirky and Moroccan that it more than made up for it, as did the soft beds and high speed Internet. The staff were friendly and helpful and the restaurant served a fabulous lamb and prune tagine! Should you wish to venture into the old souk it's right on your doorstep ! Stay here 1 night prior to tarifa ferry (as long as weather permits this!). Interesting old hotel, but virtually empty when we were there, few staff, restaurant closed, watered down juice (only time in morocco this happened) in mediocre breakfast, rooms spartan, great view, clean but poor attention to maintenance. Just okay.